HEMPSTEAD, New York, October 16, 2012 (ENS) – Green Party presidential candidate Jill Stein and her running mate Cheri Honkala were just now forcibly prevented from entering the grounds of tonight’s presidential debate organized by the Commission on Presidential Debates. Watch the video here. On Election Day, November 6, Dr. Stein and Ms. Honkala will appear on 85 percent of ballots across the country. They recently polled two to three percent in four consecutive national polls. The federal government recognizes Stein and Honkala as a qualified presidential and vice presidential candidates by giving the Green Party more than $100,000 dollars in matching funds in this election cycle. The two women were arrested by police when they tried to enter the grounds of Hofstra University in Hempstead, New York, where the debate between President Barack Obama and Republican challenger former Massachusetts Governor Mitt Romney is scheduled to take place later tonight. They are currently still in police custody. Stein and Honkala walked with supporters toward the Hofstra campus at 2:00 pm local time today. There, they were met by three ranks of Nassau County and campus police officers in uniform and in plainclothes. Stein and Honkala then turned and began walking onto the debate grounds, when the police officers physically stopped them and pushed them back. 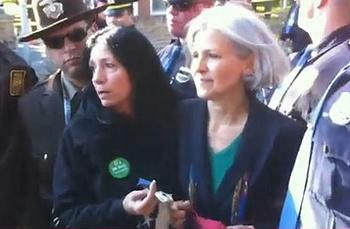 The two women sat down and the police arrested them, saying that Stein and Honkala would be charged with “obstructing traffic,” a charge Jill Stein for President staffer and lawyer Alex Howard called “bogus.” There was no through-traffic visible at any time during the incident. Born and raised in the Chicago area, Dr. Stein now hails from Lexington, Massachusetts. She is a physician, longtime teacher of internal medicine, and an environmental-health advocate and a mother. Stein co-authored the report “In Harm’s Way: Toxic Threats to Child Development,” published in 2000, and the report “Environmental Threats to Healthy Aging,” published in 2009. These reports promote green local economies, sustainable agriculture, clean power, and freedom from toxic threats. Her “Healthy People, Healthy Planet” teaching program reveals the links between human health, climate security, and green economic revitalization. It has been presented at government, public health and medical conferences and has been used to improve public policy. Born into poverty in Minneapolis, for the past 25 years Honkala has been an advocate for America’s poor and homeless. She co-founded the Kensington Welfare Rights Union and the Poor People’s Economic Human Rights Campaign. Now a Philadelphia resident, she has organized tens of thousands of people to march, demonstrate and set up tent cities. The Green Party campaign calls the Commission on Presidential Debates a supposedly “nonpartisan” entity, which is a puppet of and serves the interests of the Democrats, Republicans and the big corporations that fund both of them. Over 14,000 people have signed a statement calling on the Commission on Presidential Debates to change its criteria, but repeated public calls for opening the CPD debates have been ignored by the Commission. “The debates must include every candidate who is on enough ballots to win the White House and who has demonstrated a minimal level of support meaning either one percent of the vote in a credible national poll, or qualification for federal matching funds, or both,” reads the statement. Also excluded from tonight’s debate is former New Mexico Governor Gary Johnson, who is running on the Libertarian ticket in every state except for Michigan and Oklahoma. Johnson served two terms as governor from 1995-2003. He declared his candidacy in April 2011 in New Hampshire, originally running on the Republican ticket. There have been other protests about this issue including in Boston, home of the Romney headquarters, and in Denver and Kentucky, the sites of the two recent presidential and vice presidential debates. Stein will be participating in at least four debates coming up, during which the American people will be able to learn the real range of options available to them this election.